This Fridays photo is still to do with the farm. We have had a few storms through this last week and fast cloud movement so I have taken advantage of that and put the Kubota tractor in for some interest for those tractor lovers out there. I am having trouble typing this as we have been out most of the afternoon fixing up some irrigation hoses around some new trees and I am stiff and sore BUT hopefully by tomorrow afternoon we will be winding our way to Wollongong for a couple of days R&R and a birthday to boot. 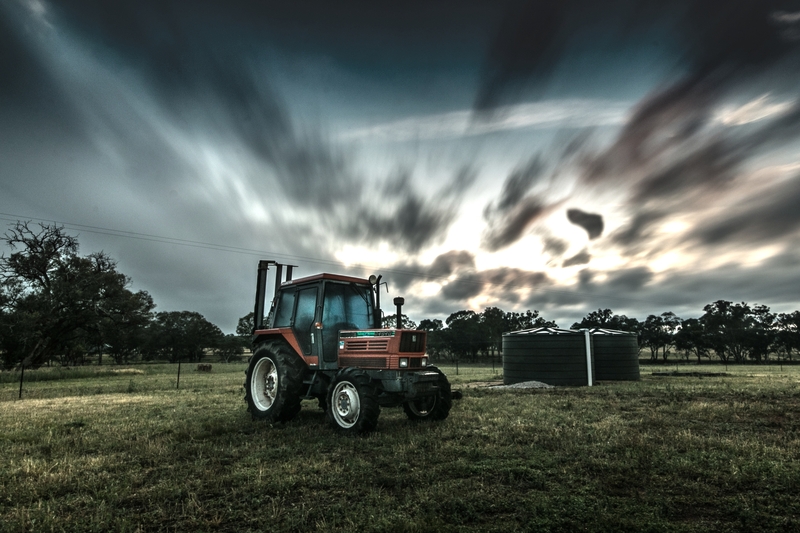 Love that sky Kaz – and the tractor! Have a great couple of days off! Surreal and beautiful!! Love it! 🙂 Nice Tractor and with those racing clouds in the background you get the idea it will be off and racing to it’s work soon – either that or it will turn into a ravaging monster machine and plough us all under. Take something simple and process it into art. Wonderful!! Very impactful. Wow, what a very cool, sort of surreal shot! Love it. Sounds like your hard work on the farm is due for a break…whew! Great photo too! Love that photo – it really shows the moody skies beautifully.